Karen Kelsky. The Professor Is In. New York: Three Rivers Press, 2015. The academic job market is a monster lurking under most grad students’ beds. Hiring works in mysterious ways, and even when you have, as I do, supportive advisors and resources for professionalization available through your institution, anything that further demystifies the monster is welcome. I’ve been a reader of Karen Kelsky’s blog since I started grad school, and have often turned to it for succinct, practical advice on things like writing conference abstracts, organizing my CV, putting together a five-year plan that includes goals and milestones that don’t necessarily show up in my department handbook. Kelsky’s background is in anthropology, and after fifteen years on the faculties of various institutions, she left academia and took her anthropologist’s ability, as she puts it, “to take taken-for-granted, implicit knowledge and defamiliarize it” in order to provide information to “Ph.D. job seekers and graduate students…about the job market and the academic career” (394). Passages like this are certainly helpful reference points—I sent a picture of one of of Kelsky’s “six attributes” to some friends, joking that I needed it on a t-shirt—but need to be read in tandem with chapters scrutinizing the academic system and why it works (or doesn’t work, as the case may be) the way it does. For this reason, I would unhesitatingly recommend the book above the blog. Kelsky is up front about the fact that her advice necessarily relies on generalizations. Every grad student and every job seeker in each field will have a different experience, and the job market does involve chance at some point—I’d point fellow Classicists toward Joy Connelly’s “Job Market Handbook” for some advice specific to our field. One of the most useful chapters of the book, from this point of view, is chapter sixty, another blog-like list, this time of 111 transferable skills to jumpstart thinking about possible careers outside the ivory tower. Because so few faculty members have experience pursuing alternative career paths, at least in the humanities, and because of the stigma attached to “dropping out” of academia, it’s hard to have conversations about the topic of alternate careers. Eleventy-one transferable skills are a helpful starting point for considering possibilities outside the academic shire. The major complaint I have about the book is the amount of space devoted to promoting Kelsky’s relatively new one-on-one coaching services; at several points, the book feels like promotional material, complete with customer blurbs. 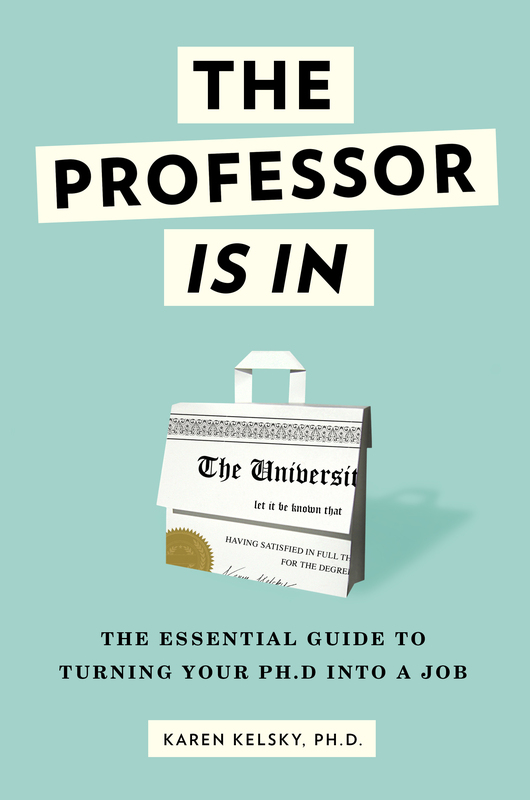 The Professor is In is good advice well worth reading, with the caveats that go along with any job market advice. When you’re trying to slay the monster under the bed, you can’t ignore it or let it rule your life with fear, but no one strategy guarantees victory.